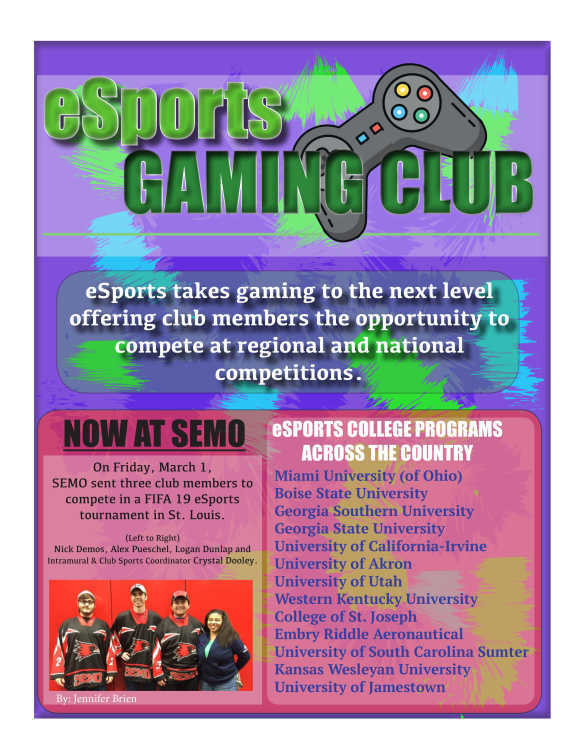 As of this semester, students have the opportunity to experience video game competitions both at regional and national locations as the eSports Gaming Club becomes official at Southeast. With video games continuing to evolve worldwide, eSports competitions are providing gamers with an opportunity to compete in the same vicinity while playing games such as “Madden NFL,” “Call of Duty,” “Halo,” “Mario Kart,” “FIFA” and “Fortnite,” a fan favorite in 2018. With the growing interest and popularity of video games amongst college students, it was not long until the original eSports organization transformed into an official club at Southeast. Eric Redinger, associate director of Recreation Services, helped steer the process of approving eSports as a club. “The eSports Gaming Club has existed on campus but has never been truly organized to where it was eligible for funding through rec services,” Redinger said. Once eSports was eligible as a sports club, they were then approved for funding from the Recreation Services department that comes through the Student Government Association. “Student government actually allocates out a certain amount of money for the clubs, then they trust my department to divvy out to those clubs because we make sure that they’re spending that money wisely,” Redinger said. Funding for clubs is primarily used for registration fees, fuel for away events and anything else that may benefit the club. With roughly 14 members, the club hopes to spark interest in more students and encourages video game users to join. “eSports is really providing students with the opportunity that they wouldn’t have otherwise,” Redinger said. A few of those taking advantage of the unique opportunity are Nick Demos, Alex Pueschel and Logan Dunlap, who all represented Southeast on March 1 at the FIFA 19 eSports Tournament in St. Louis. The tournament brought a variety of competitors, spectators and media outlets, such as St. Louis radio station, 101ESPN. With so much attention around the tournament, Demos said the atmosphere was intense when it came time to play. With the champion having to win six games, none of the SEMO competitors finished as well as they had hoped, but still gained valuable experience from the tournament. “We didn’t do too well, but we stayed throughout the entirety of the tournament, and a lot of people were stoked that a college was there,” Demos said. The FIFA tournament showcased a wide range of competitors with representatives from two colleges, SEMO being one of them to individuals from all over including a competitor who drove from Columbus, Ohio. Club members are planning to continue practicing in their preferred video game genre in preparation for future competitions. “I was super stoked about this competition just to get my feet wet and get into the new environment, but definitely the next competition will be [first-person shooter] which is what I am much better at,” Demos said. A first-person shooter is a type of video game that allows gamers to see the full screen while navigating through the video game. As the club continues to grow, there is hope among members for a gaming laboratory that can be created and used for practices or mock competitions. Demos recommends students interested in video games to give it a try. He said the experience is thrilling and exciting while not being overly competitive. As for what is next, Demos and other club members plan on frequently practicing their preferred games in preparation for upcoming future competitions.